The name Rigodunum can only tentatively be assigned to Castleshaw. Rigodunum is mentioned in a list by Ptolemy (during Hadrian's reign) and indicates a site in about the right area on Ptolemy's (somewhat distorted) map of Britain. A number of authorities have noted that the name 'probably' can be assigned to Castleshaw (see Ordnance Survey map 'Roman Britain'). Intriguingly Rigodunum means 'Royal Fort'. Circa AD79, during the reign of British Governor Gnaeus Julius Agricola (under The Flavian Emperor Titus) the Roman's built a road across the Pennines linking the legionary fortresses at Chester and York via Manchester and Tadcaster. To protect the Roman interests from the local Brigantes, a string of forts from Chester (at Manchester, Northwich, Castleshaw, Slack, Leeds (?1) and Newton Kyme (Tadcaster)) to York were built, each being about a day's march from the previous. The high Pennine crossing point was sandwiched between the fort at Castleshaw and the fort at Slack. Castleshaw is sited on a small spit of raised land at the head of the valley, and the fort at Slack lies beneath the shade of the northen slope of Nettleton Hill, Outlane. Slack is slightly larger and covers 2.9 acres (1.2 hectares). Behind a turf rampart with four gateways and external double ditches (though these seem to be missing from on the eastern side at Castleshaw!) 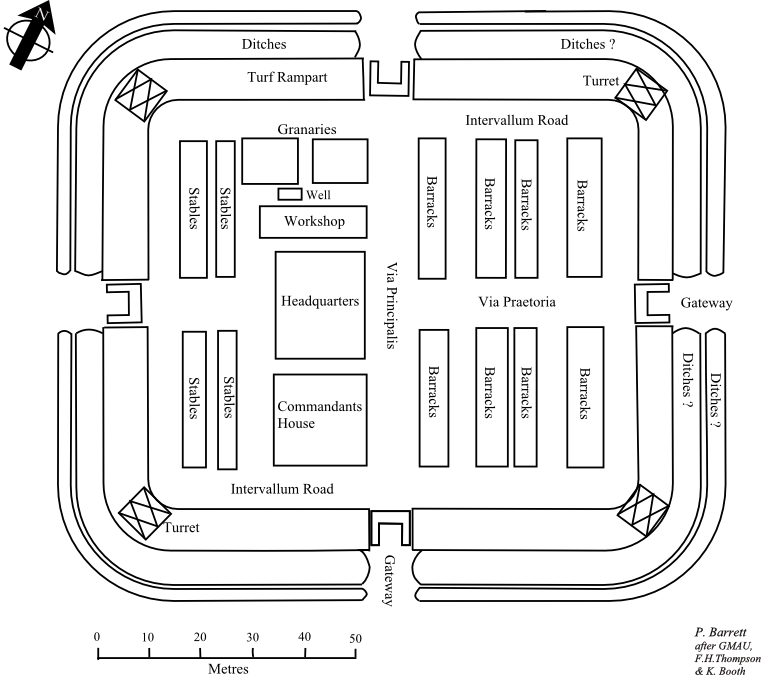 the fort contained a number of buildings, currently believed to be: barrack blocks, stables, granaries, workshop(s), a headquarters building and a commandant's house. The Roman road2 passed the fort on the south side and it is believed that in this area a small settlement also grew up, possibly to trade with the Romans and with traffic along the road. It is also highly likely that a bath house would have been built near the fort though this is still waiting to be discovered. 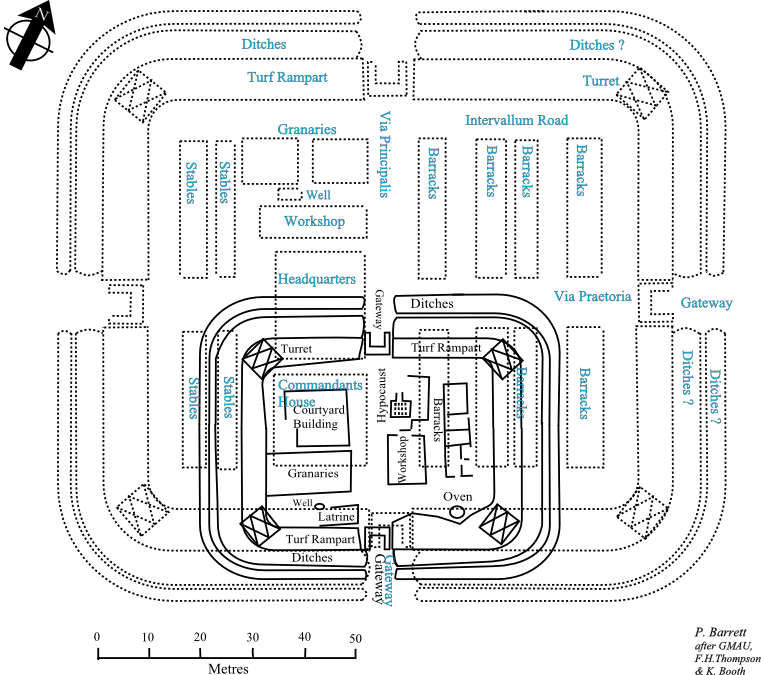 (The bath house at the almost identical fort at Slack was situated about 20m from the eastern corner of the fort). The fort appears to have been occupied until about AD90 when it was abandoned during a period when the Roman army in Britain was being reorganised. Some fifteen years later (circa 105AD, Emperor Trajan) the site at Castleshaw was again occupied by Roman troops but rather than re-using the original structure, a new, smaller fortlet was built just using the southern area (and rampart) of the previous fort. Again ramparts were build but this time enclosing just one half of an acre and with gates in just the north-east and south-west ramparts. The ramparts were built with more care that the original fort's defenses. There was a stone rubble foundation, drains and neat kerbs. The fortlet appears to have been abandoned after 15 to 20 years (approx AD120 to AD125) possibly due to manpower being required further north along the new frontier at Hadrian's wall. 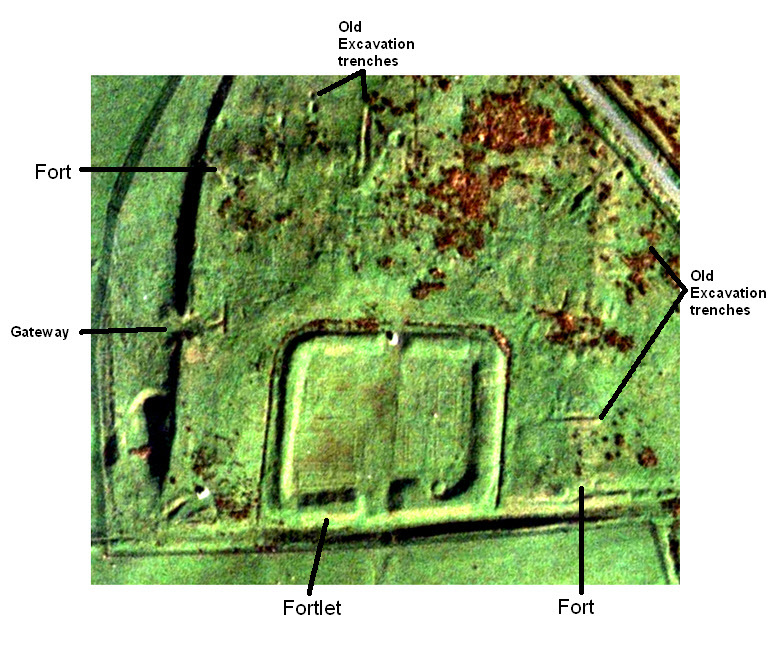 Whether civilian settlement survived between the periods of Roman occupation and after the abandonment of the fortlet is not currently known. Over the years there have been a number of excavations at the site and in the 1980's the Greater Manchester Archaeological Unit (GMAU) performed a major 'clean-up' of the fortlet area removing a large number of spoil heaps left by previous excavations that actually gave an impression of false ramparts. It is believed that only some 35% of the fort area has been excavated. 2 No-one knows what the Romans called their roads, or even if they had names or designations so, to make life easier for Archaeologists, Ivan D. Margary in his 2 volume work 'Roman Roads in Britain' (1957) assigned the number 712 to the 46½ mile road from Manchester to Thorner (N. Leeds). Thus the road through Castleshaw is known as Margary 712 (or M712).